What better way to experience the history of a site than to have a hand in actually preserving it? This was the thought behind the founding of Adventures in Preservation, originally named Heritage Conservation Network, back in 2001. The nonprofit’s founders, Judith Broeker and myself, Jamie Donahoe, were both long-time preservationists and inveterate world travelers. We had seen a great many buildings in poor condition, as well as buildings that had been “restored” without the benefit of conservation expertise. Capitalizing on the concept of volunteer vacations that was just coming into vogue, we decided to create a non-profit organization that would provide volunteers and conservation expertise to heritage sites around the world. The net result is a slate of projects that provide an enriching travel experience for travelers; building conservation training for local citizens and other interested students and professionals; and valuable labor for historic sites in need. Today the organization also stresses the community benefits that accrue from preservation, whether it’s support for heritage tourism, creation of a community facility, or sustainable economic development. The host communities benefit from AiP preservation projects in myriad, and long-lasting, ways. In Ghana, for example, the building being restored is to become a culinary school and hospitality training center. In Shreveport, Louisiana, renovated shotgun houses will form the basis of a new business district in the Ledbetter Heights neighborhood. In Gjirokastra, Albania, conserving the city’s massive stone tower houses is the key to building a sustainable, heritage tourism-based economy in a city with few resources other than its rich architectural heritage. Helping restore the Skenduli House, with the opportunity to explore the steep streets of the “city of stone”, is a wonderful way to experience this World Heritage city. AiP’s initial projects were in our home states of Colorado and New Jersey, but then word spread and now all projects are generated from the field via the Nominate a Project process on the website, adventuresinpreservation.org. AiP receives many more requests for assistance than we can currently fulfill. AiP is therefore always looking for more people to join its hands-on preservation projects, as well as corporate sponsors and individual donors to support its work. Twelve years on, Judith and myself are still involved in the day-to-day management of the organization, supported by a volunteer staff located around world. Judith’s favorite projects have long been the ones in Eastern Europe, and she enjoys opportunity to travel there each year. She, along with anyone else who’s joined an adventure, invariably cites their fellow jammers, as they’re called, as the highlight of each project. The groups are made up of people from all different ages, occupations, and cultures. Yet each time, they form a strong bond and work so well together that the work becomes fun. Which, after all, is the point of a working vacation, no? 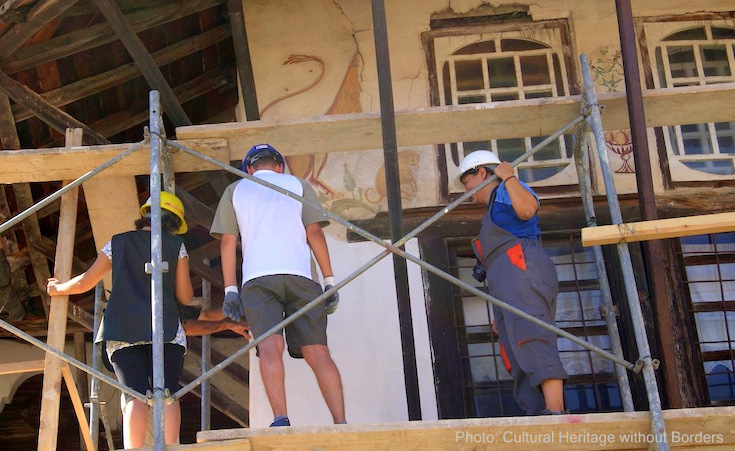 Left: Judith Broeker, right , and two fellow jammers carefully remove paint to reveal the original color scheme in the chapel of a manor house in Oplotnica. After AiP’s project focused national media attention on the building, the community received EU funding to finish the restoration and the building is now a community center. Right: The bucolic setting of the Beškovnikova Homestead, Vitanje, Slovenia, where restoration work on the cottage is just one aspect of an intergenerational experiential travel program for families. For me, the highlight thus far has to be the restoration of the Francis Mill, in Waynesville, North Carolina, because of the way the community itself got behind the project. A neighbor donated a hemlock tree from his yard to serve as the new 26’ sill beam; the sawmill trimmed it and delivered it to the site. A local company donated the use of a boom crane to maneuver the beam into place after two weeks of preparation work. When the hard-working crew slid that beam into place the last hour of the last day, it was a feeling like no other, my own “I’m king of the world” moment, having saved a building from imminent collapse. This was in 2004; AiP sent volunteers to the site for two more years, and continues to support the Francis Mill Preservation Society from afar even now. Today, the mill building and the mill itself have been completely restored and are fully operational, grinding corn for school groups who come to learn about their local heritage. Carefully measuring before cutting the tenon on one of the new oak posts put in to stabilize the Francis Mill, during the first year of restoration work and right, raising one of new posts into place in preparation for the new sill beam that would stabilize the 1870 timber frame structure. Jammers learned how to make the mortise and tenon joints that traditionally allowed for nail-less construction. Raising awareness of people’s own heritage is another component of AiP projects. In many places, there is so much focus on the new that not only are heritage buildings being lost but so are the traditional building skills needed to maintain them. By providing training and raising awareness of the significance of their heritage, AiP is helping keep both alive. AiP envisions a world where people understand, appreciate and use historic buildings, and involving the local community in their preservation is a key part of AiP’s strategy. Time and time again, preservation has proven a powerful tool for change, for economic improvement and for environmental sustainability. AiP is bringing this message around the world; jammers have painted and plastered, hammered and hewn at projects in seven different countries thus far. Next year, AiP has projects in Europe, with projects in Albania, Italy and Slovenia, and in the US. There will be even more projects the following year as projects currently under development in Ghana, Ecuador, Armenia, Ukraine and the US come on line. Each project is also an opportunity for travel, adventure, and personal growth, and AiP welcomes people from around the world to join a project and “jam” with them. 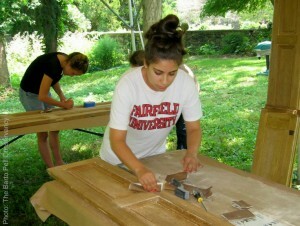 Left: Sanding historic interior shutters belonging to the Bartow-Pell Mansion Museum, a National Historic Landmark in Bronx, New York. 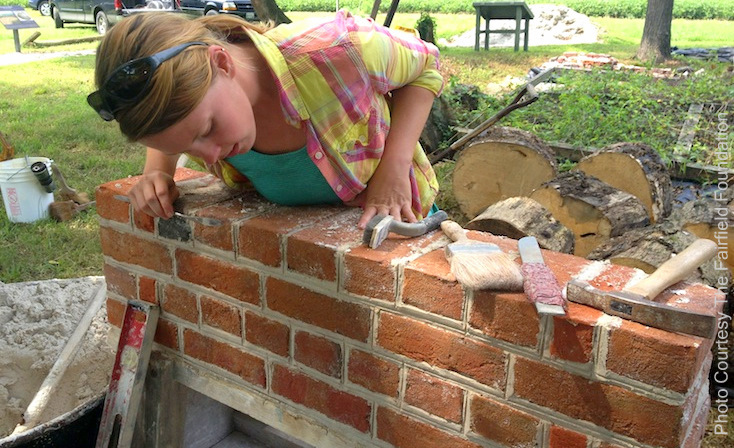 Header photo: The Fairfield Foundation – Anna Haydon inspects her handiwork after learning how to lay bricks in Flemish bond at a project that combined archaeology and preservation. Learn more about ways you can truly get your hands on history by exploring travel options with Adventures in Preservation at adventuresinpreservation.org. As someone who has always derived a good deal of satisfaction working with my hands and putting things to rights Adventures in Preservation immediately struck a chord when I first chanced across their web site. Traditional buildings (and boats) appeal to me; it’s about the skills that have gone into them, the knowledge of materials used – particularly when they’re built of local materials, stone, wood .. from nearby and are rooted in the environment. Believing too that travels are the richer for making connections and being part of something bigger than yourself, partaking in a project of this nature is one of my goals for the future. Have you helped repair or restore a building? Please leave a comment, we’d be very interested to hear about your experience.